Practice of the Prajnaparamita: Dedications for His Holiness the Karmapa’s good health, long life, and the flourishing of his Dharma activities. 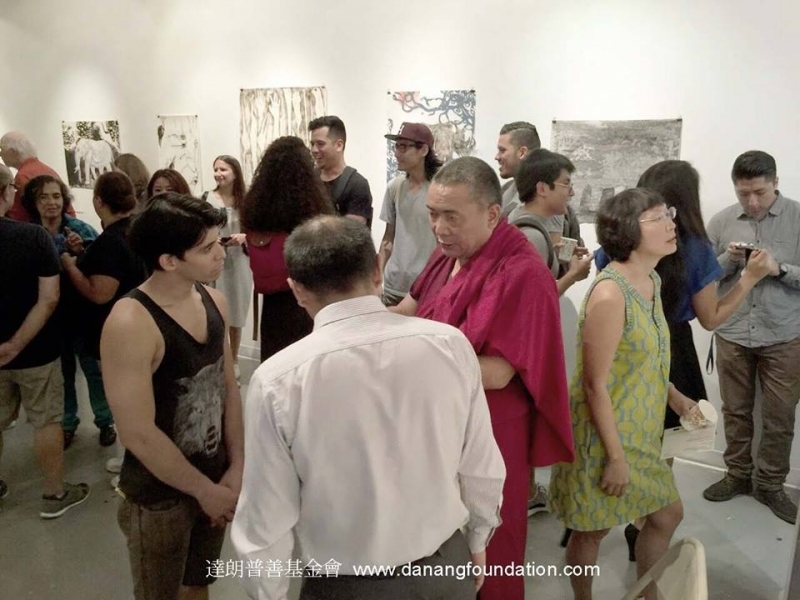 Organized by Tibet House, Hong Kong 8/26/2016 His Eminence the Kyabje Yongzin Ling Rinpoche visited Danang Foundation. 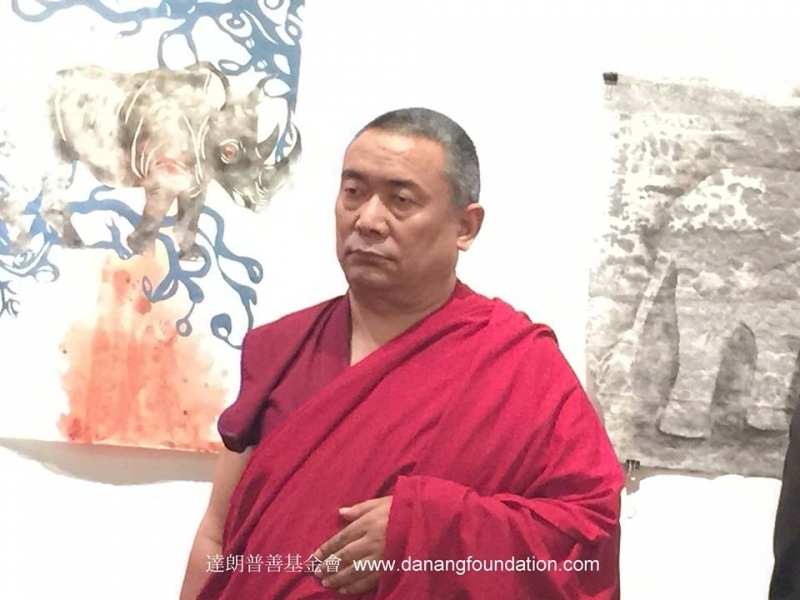 8/26/2016 His Eminence the Kyabje Yongzin Ling Rinpoche visited Danang Foundation. 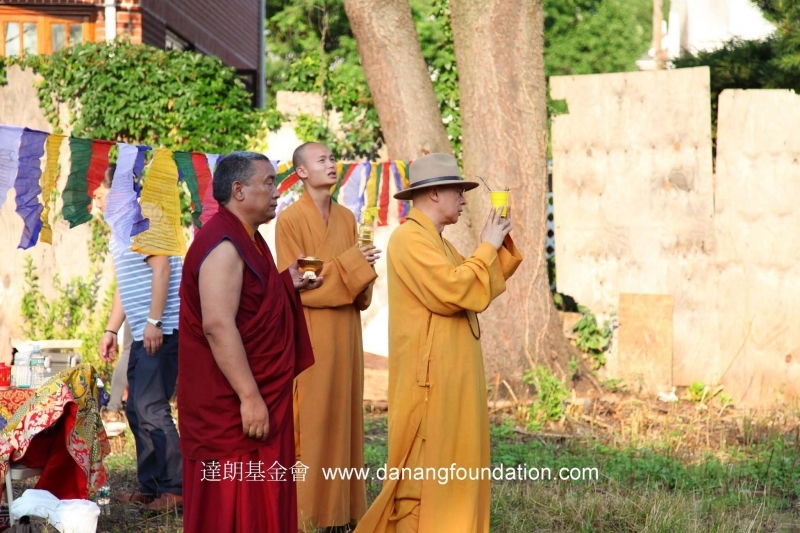 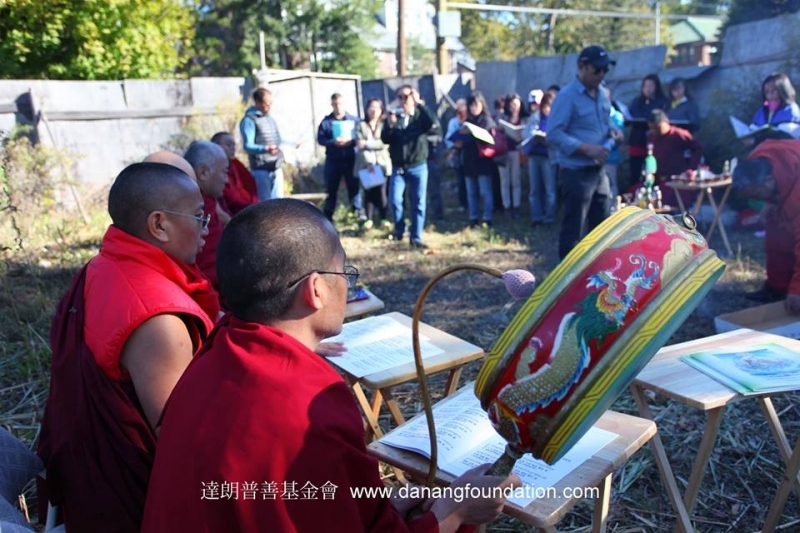 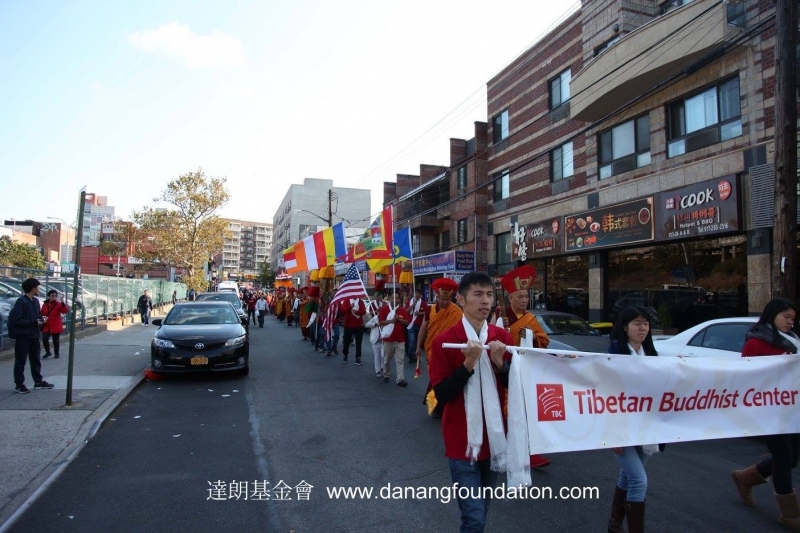 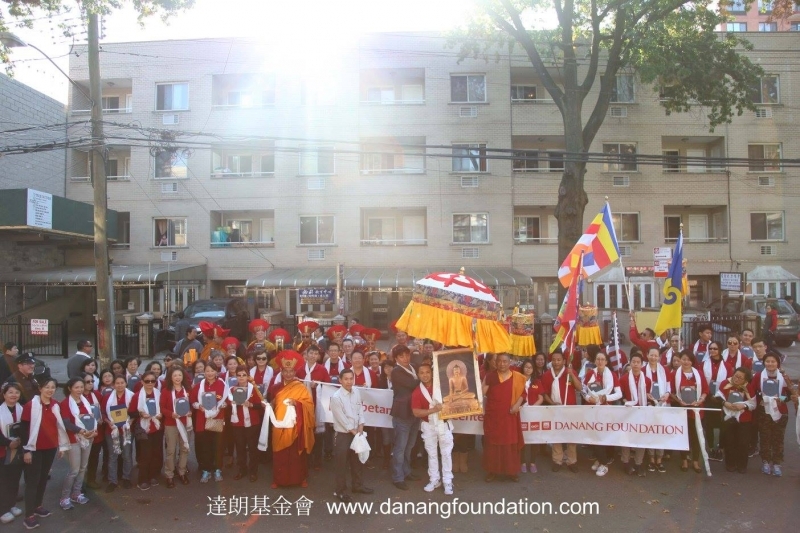 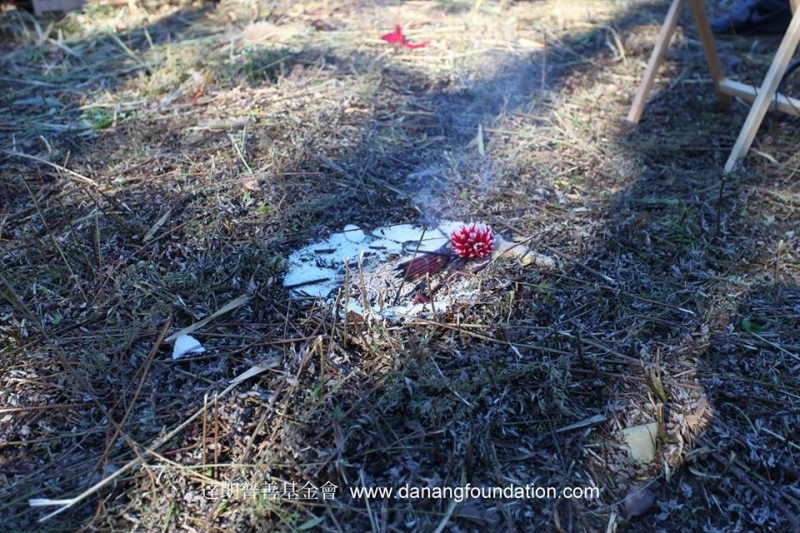 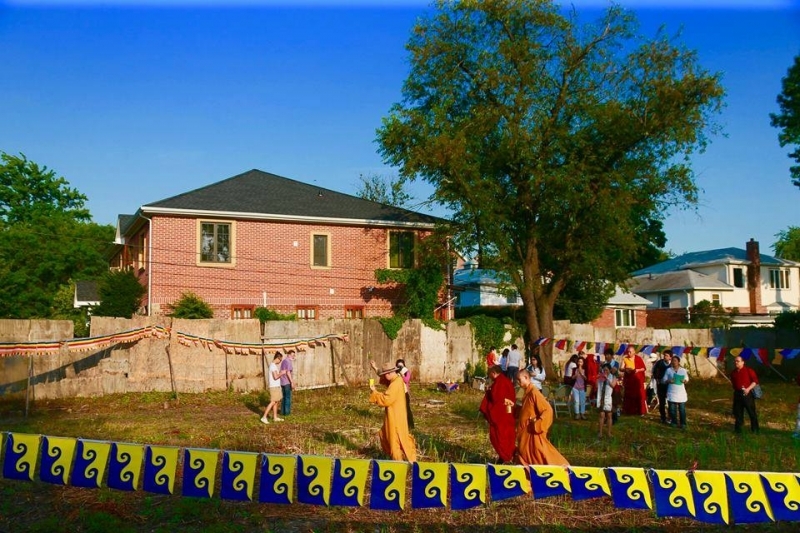 7/20/16 Danang Foundation invites Mahayana Master Haitao to preside over a cleansing, blessing and obstacle-clearing ritual for His Holiness the Karmapa’s site for His seat in New York. 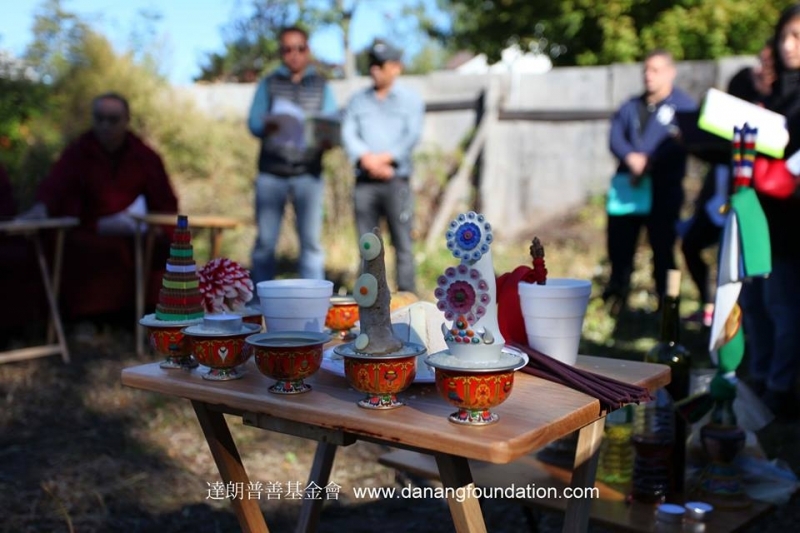 Devotees and staff of Danang Foundation made preparations under the directions of Umdze Sonam, and all went well and smoothly. 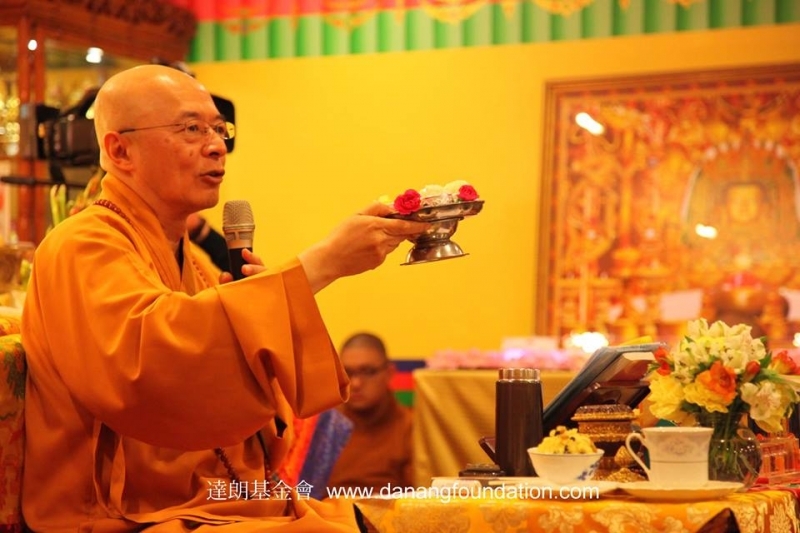 Meticulously, Master Haitao circumambulated the site. 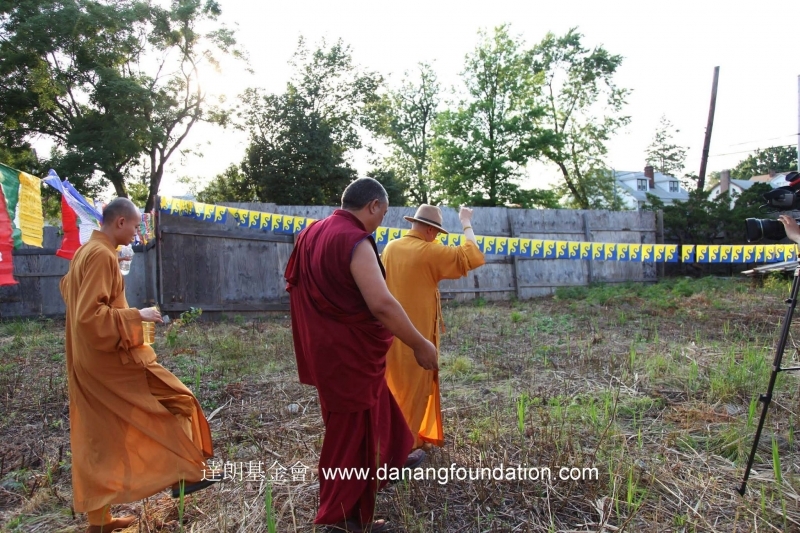 Before the ritual concluded, he made divinations with regards to the monastery’s construction process. 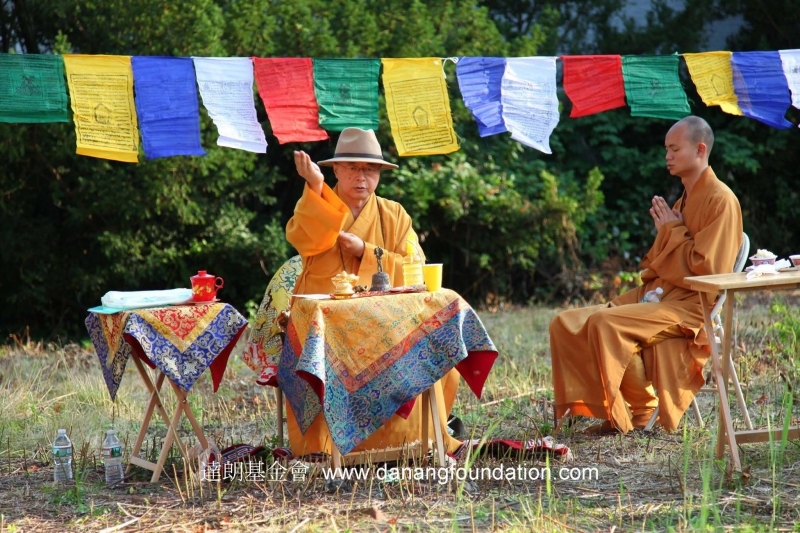 At that moment, a rainbow appeared in the sky – no doubt an encouragement to keep hopes high and persist in the practice! 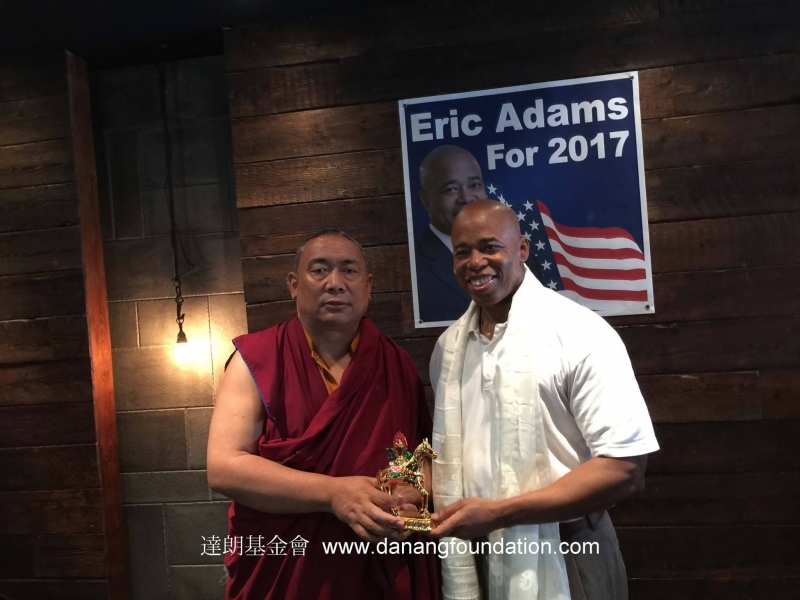 7/10/2016 Tsewang Rinpoche was invited to give blessings, and to exchange by Eric Leroy Adams (Borough President of Brooklyn, New York City), who is set to run for public office. 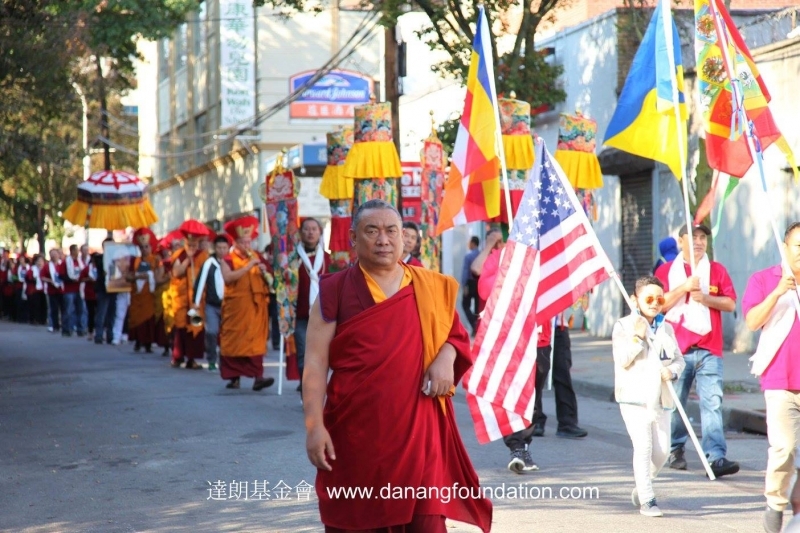 Rinpoche said, “Public officials are caretakers of the public, and dependents of the people’s prosperity. 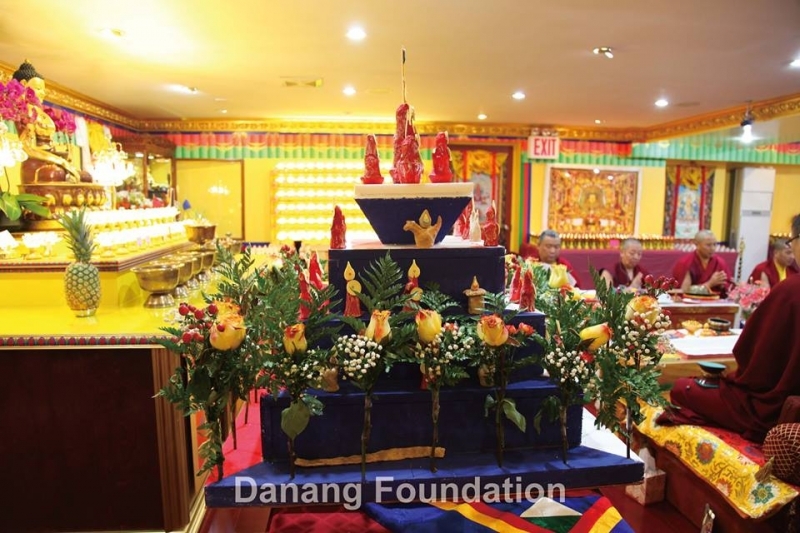 Activities that benefit self and others is Dharmic work. 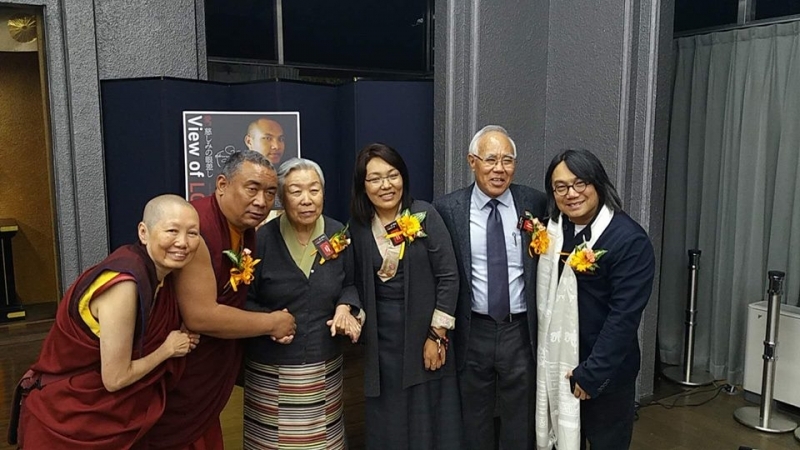 Those who bring prosperity to the people will be blessed by the Three Jewels, may their careers flourish!” Rinpoche urges all politicians to develop society by working towards social cohesion, eliminating racial discrimination, and promoting more work and advancement opportunities for marginalized people. 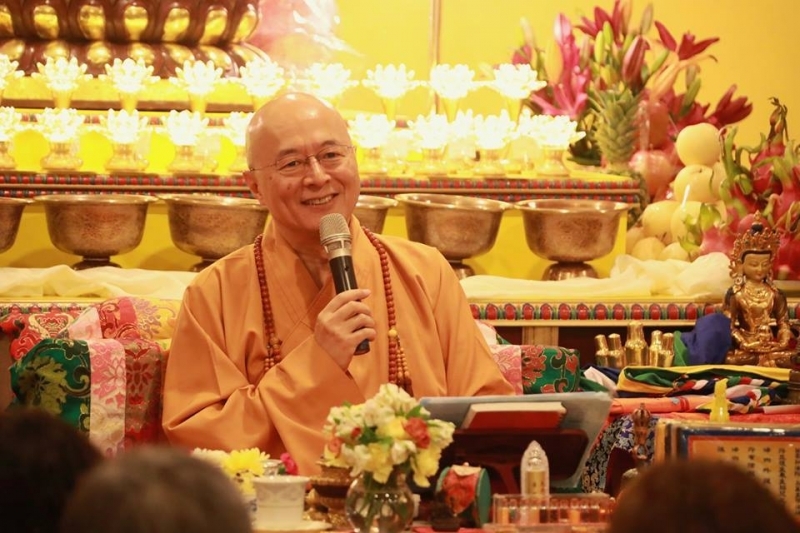 In this way, everyone will be spared sufferings and the causes of sufferings, gaining instead, happiness and causes for happiness. 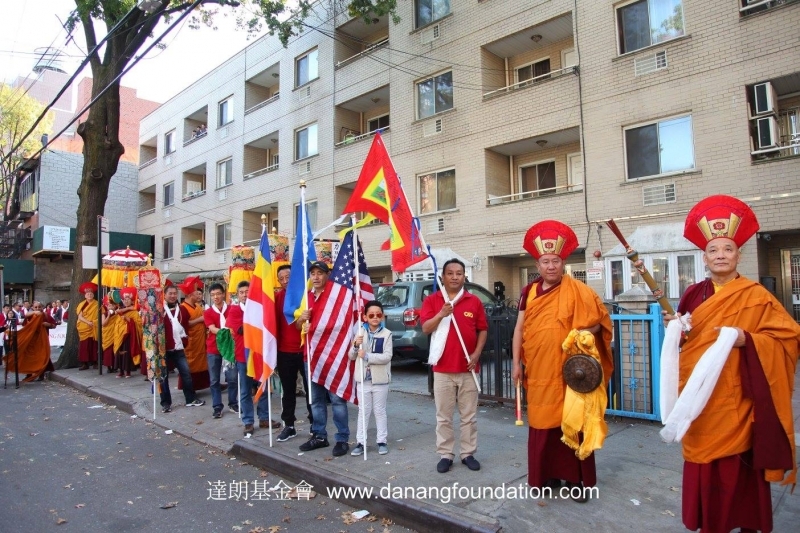 After all, a community of harmonious co-existence is a win-win for all. 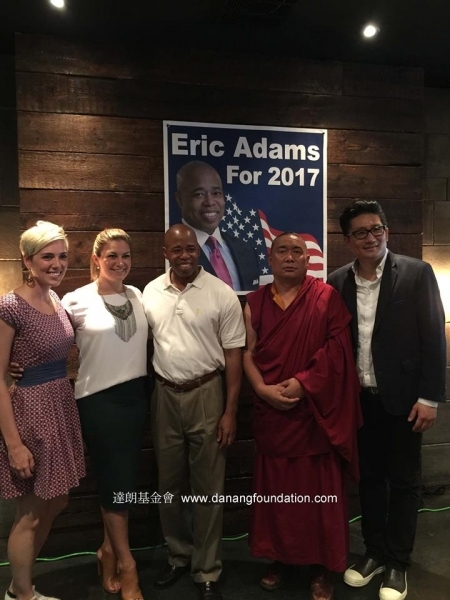 Accompanied by the Foundation’s lifetime member, Mr Raymond Zhang, Rinpoche also exchanged views with other guests, including Mr Eric Leroy Adams, and Miss America 2013, Mallory Hytes Hagan. 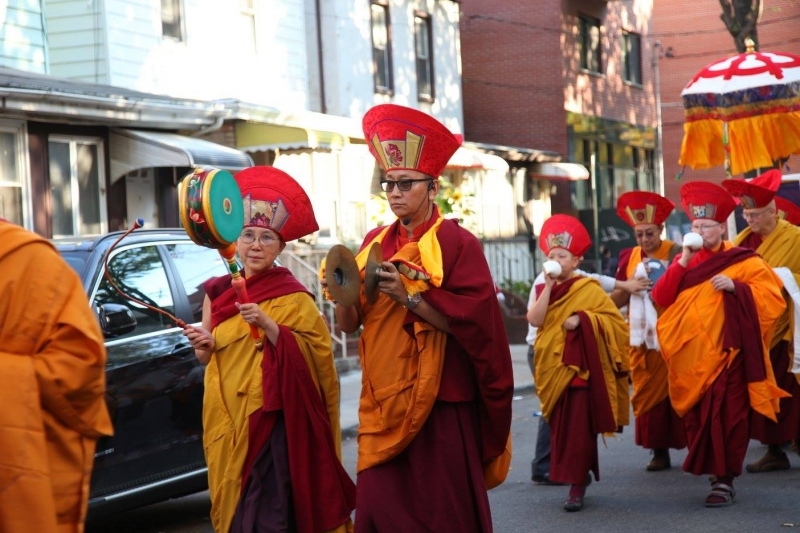 7/5/2016 Tsewang Rinpoche welcomed Venerable Mingyur Rinpoche on his New York visit. 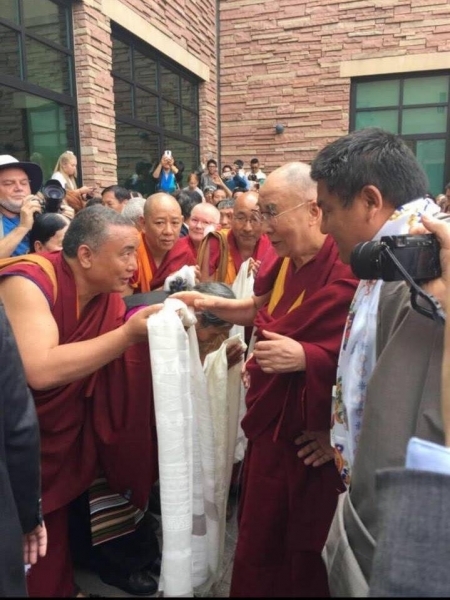 6/22/2016 Tsewang Rinpoche met His Holiness the Dalai Lama in Colorado, USA. 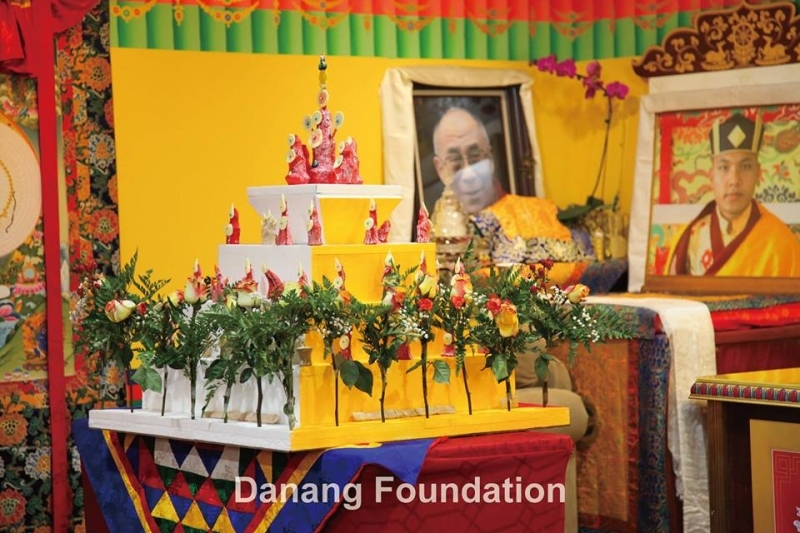 On 5/2/2016, Tsewang Rinpoche, director of Danang Foundation, hurried to Seattle, to pay respects to His Holiness Jigdal Dagchen Rinpoche, who had entered paranirvana. 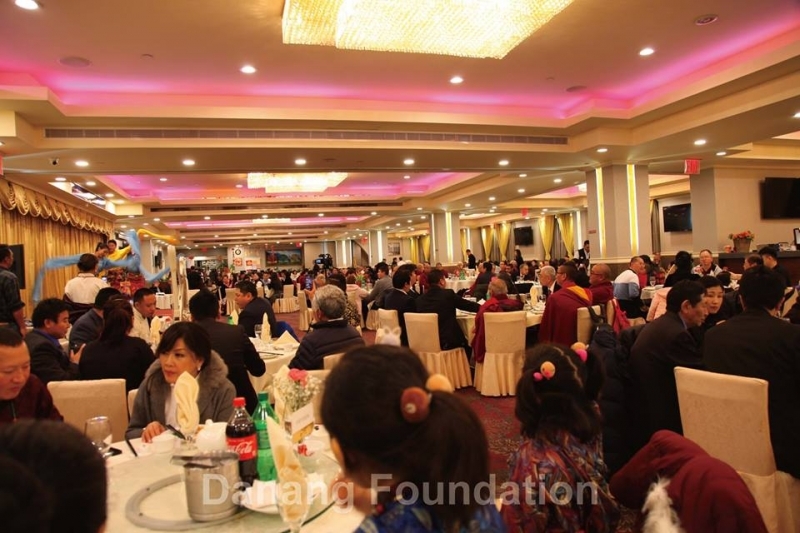 At the same time, Tsewang Rinpoche had an audience with His Holiness the Sakya Trizin, who assured Rinpoche that, in the near future, His Holiness would visit New York, and grant Danang Foundation an empowerment and teachings. 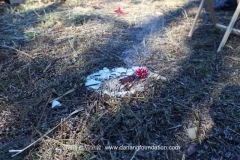 All interested parties should sit tight in anticipation! 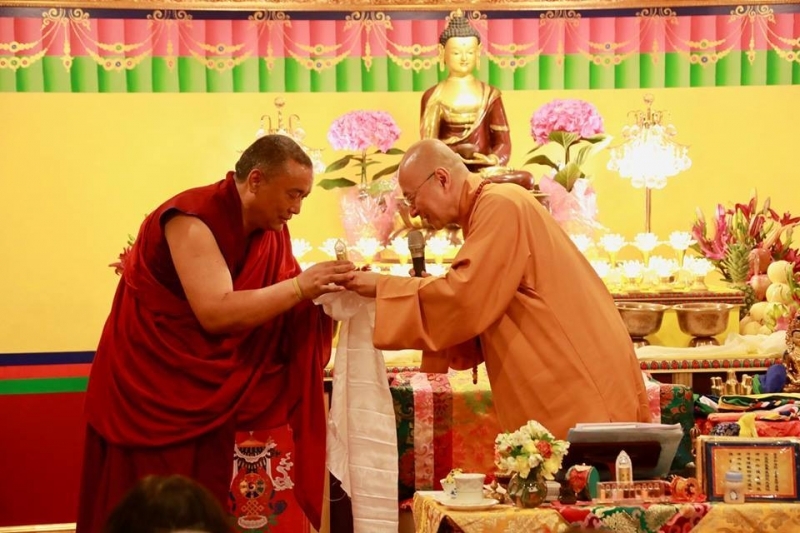 Tsewang Rinpoche met with the Venerable Mingyur Rinpoche. 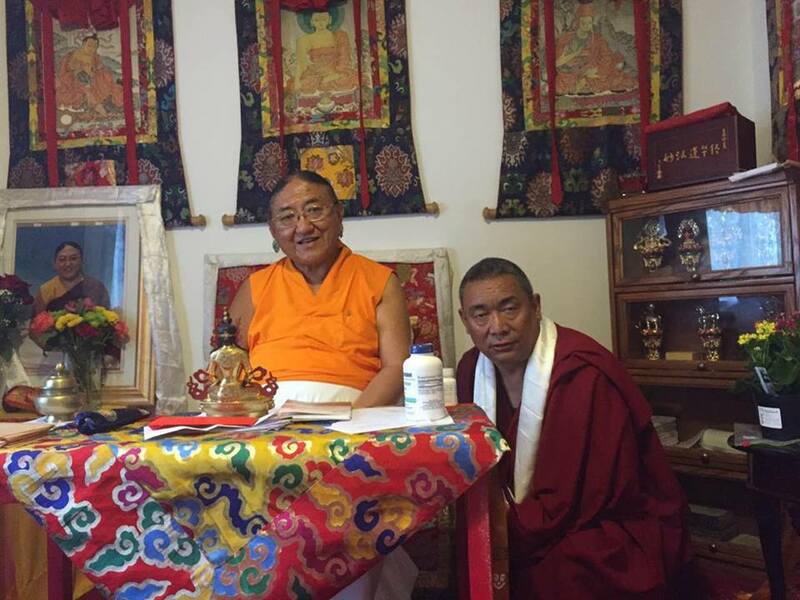 3/27/2016 On his trip to Nepal, Tsewang Rinpoche met with the Venerable Mingyur Rinpoche. 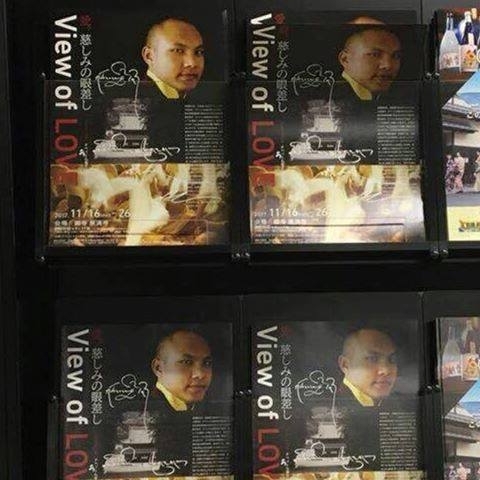 When the Ven. 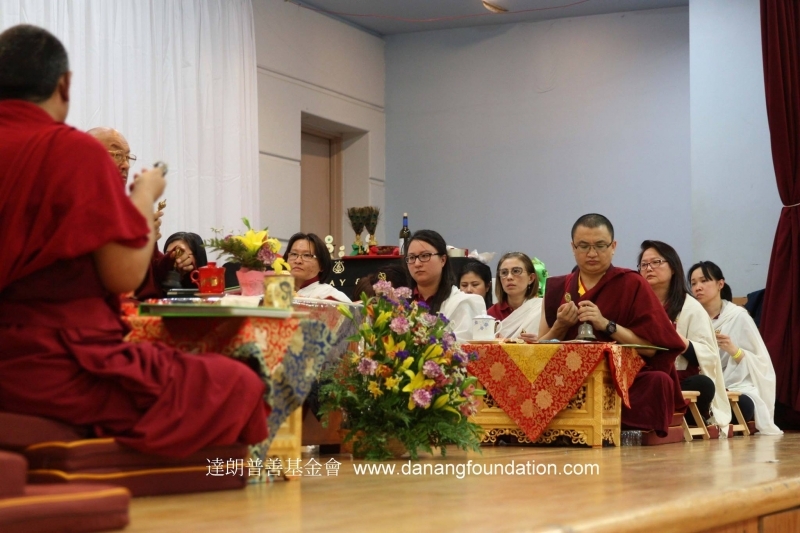 7th Dzogchen Ponlop Rinpoche visited Danang Foundation, he rejoiced at the foundation’s milestones and efforts since its founding a decade ago, and generously shared with Danang staff, his many years of experience harnessing the potential of modern technology to disseminate the Dharma. 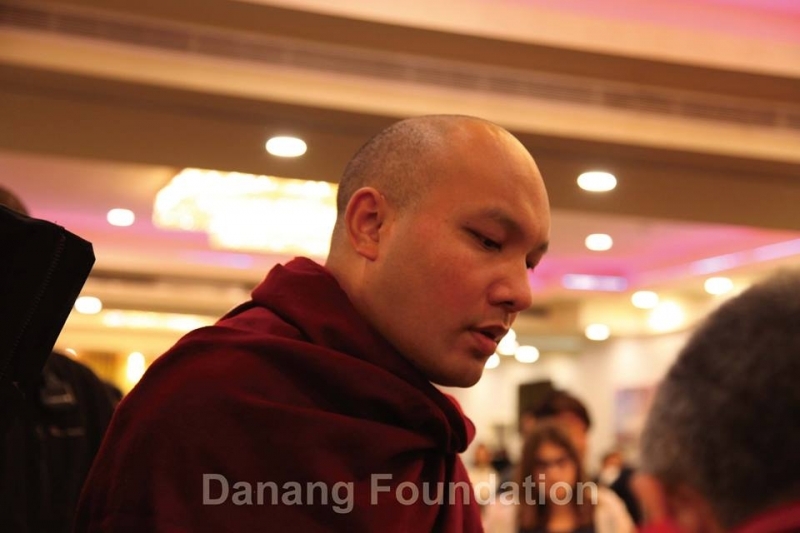 Out of his deep love and respect for books and education, Ponlop Rinpoche had worked for the Students’ Welfare Union and served as head librarian when he was at Rumtek, and was chief-editor for the Nalandakirti Journal. 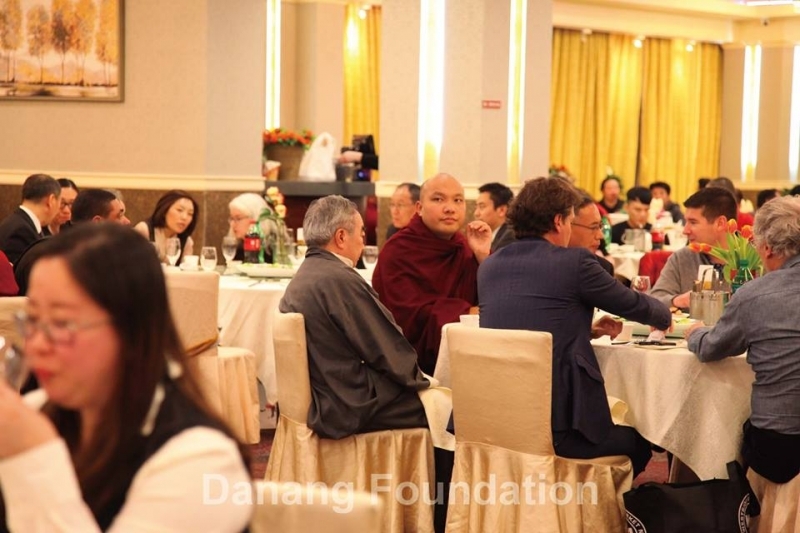 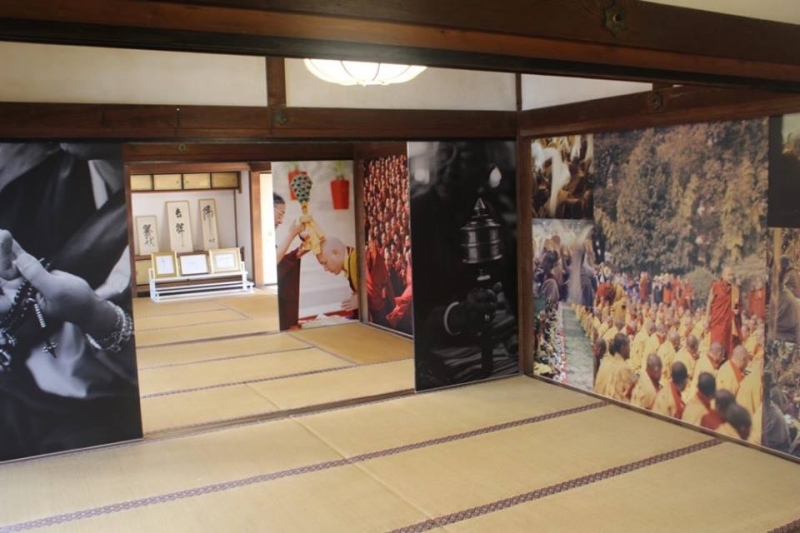 As such, it was natural that he expressed interest in Danang Foundation’s newly established Buddhist library and its other projects, which include the reprinting of ancient texts. 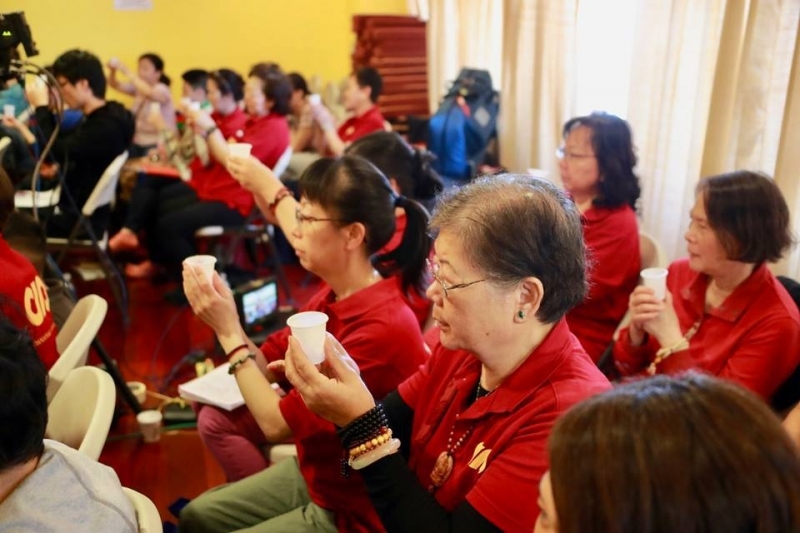 Ponlop Rinpoche also suggested that multimedia and interactive technology could be incorporated to better facilitate Dharma learning for academics and disciples alike. 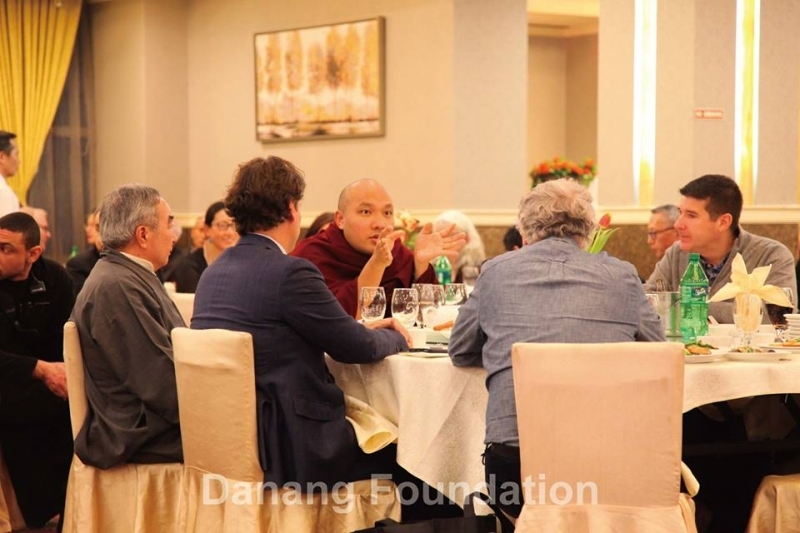 Danang Foundation is happy to report on the expansion of our altruistic work within the five missions, and to debut the new Danang Foundation logos. 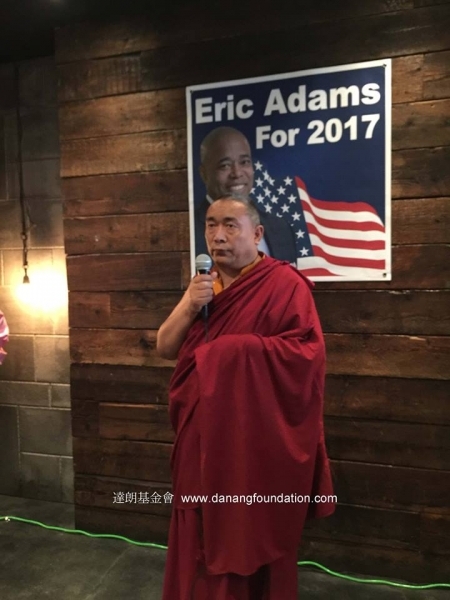 • hosted public teachings by His Holiness the Dalai Lama and His Holiness the Karmapa in 2014 and 2015 respectively, in New York. The teachings were attended by some 2000 at full capacities. 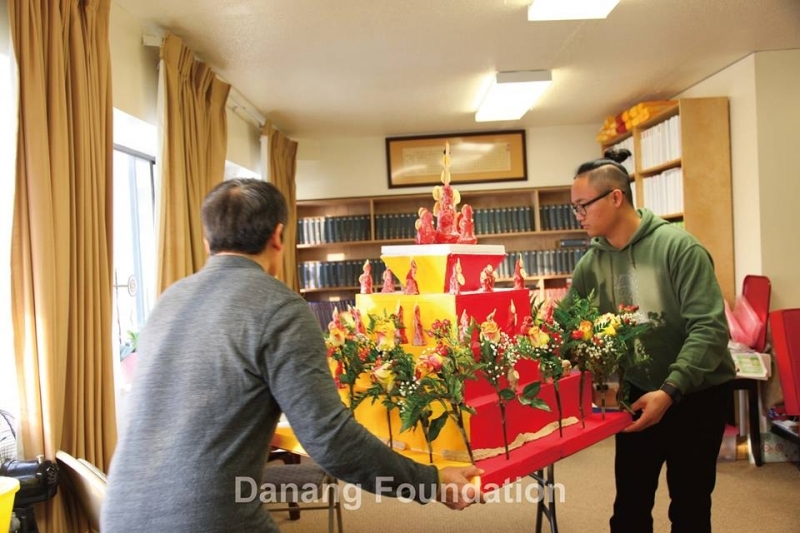 completion of the development of Danang Library’s digital infrastructure. 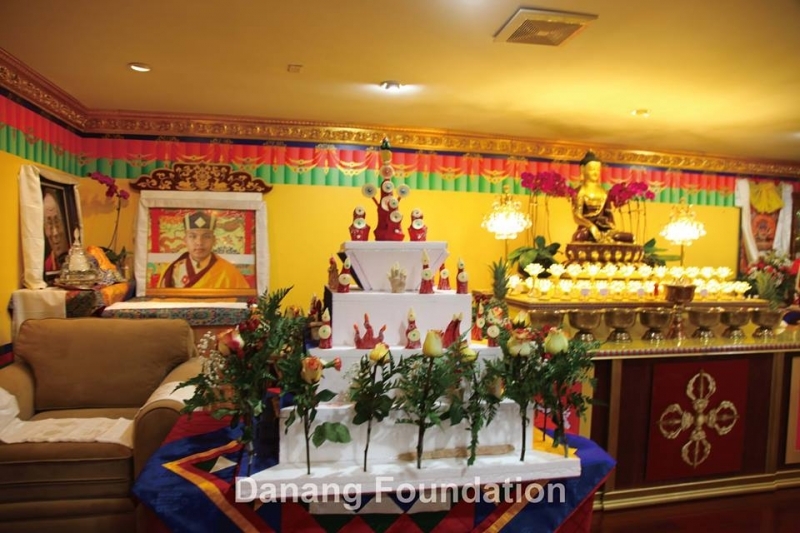 Danang Library currently houses the entire Tibetan and Chinese canons of the Buddha’s teachings and commentaries in Chinese, English and Tibetan, teachings by masters in the Chinese Mahayana lineages as well as books on other subjects, such as the humanities, history, literature and the five sciences in Tibetan, Chinese and English. 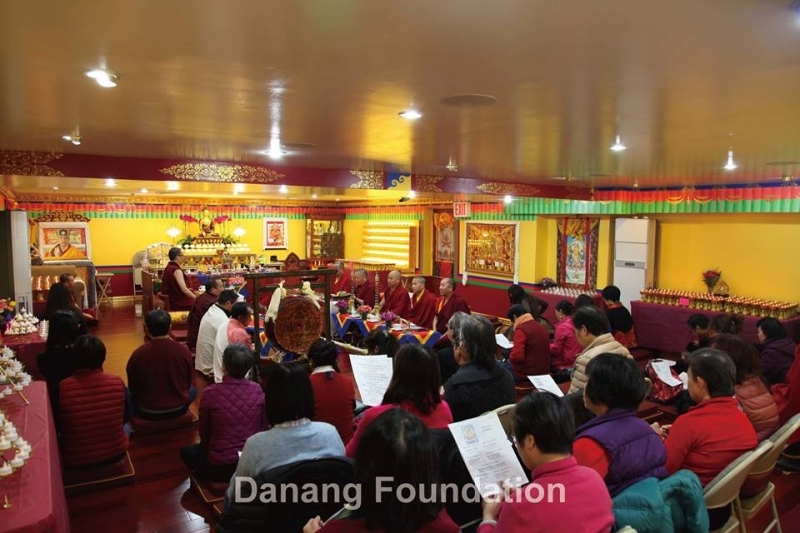 • launch of Danang Publications’ online access to its translations of some 30 English and Chinese sadhanas and practice texts. 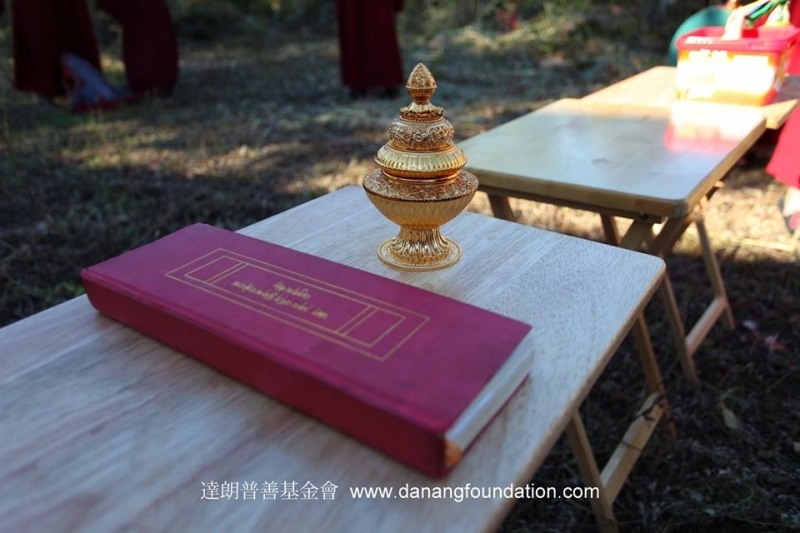 Danang Foundation also distributes these texts to practice centers and disciples around the world. 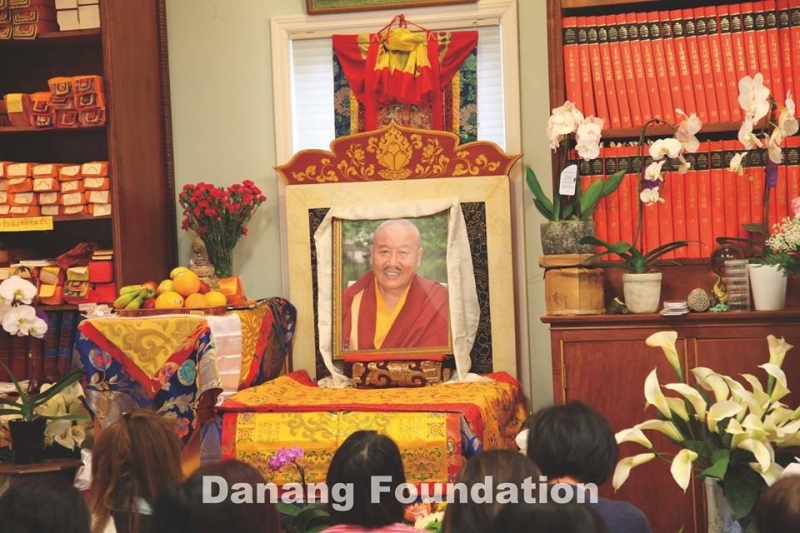 These texts will be available for view online, and for one-time download by members for personal use. 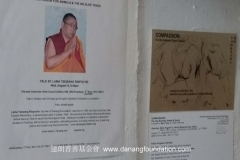 In accordance to the Foundation’s ethical practices, these texts are not for commercial purposes. 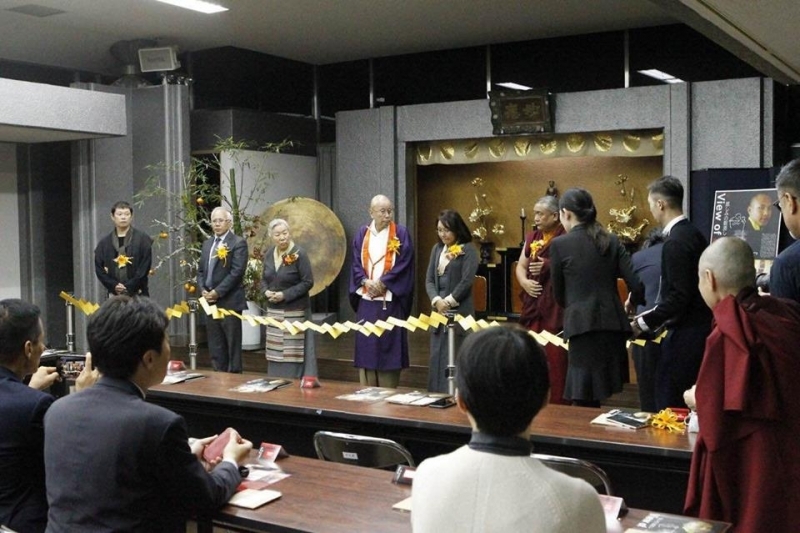 • restoration and conversion of ancient texts for electronic storage. 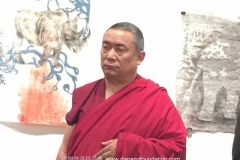 Tsewang Rinpoche has witnessed the inevitable wear and tear, and disintegration of Buddhist texts from a myriad of reasons. 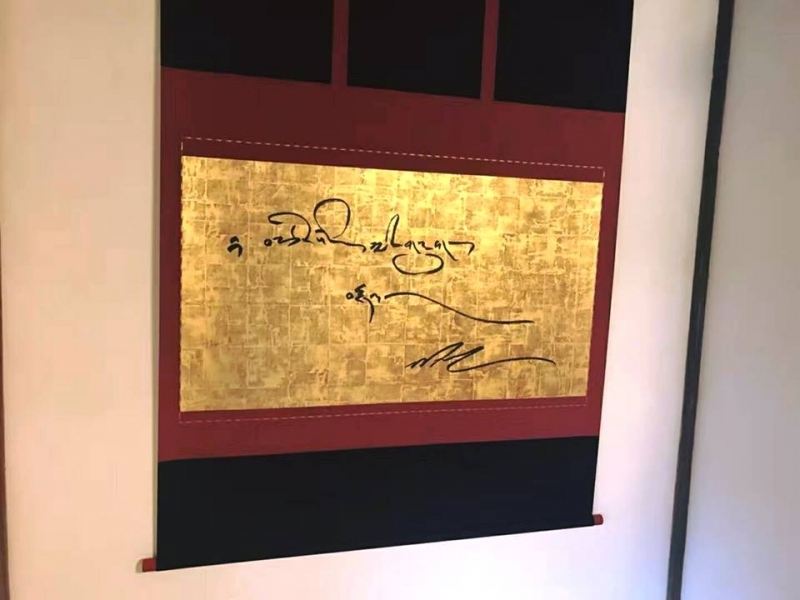 He has generously devoted efforts, including the enlistments of scholars and Acharyas, to preserve these texts and donated fresh prints to major Kagyu monasteries for use and storage. 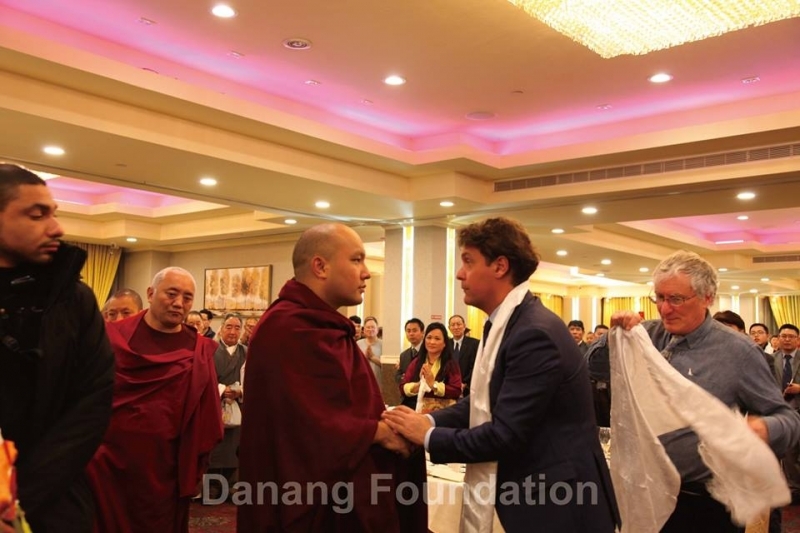 This project was given much endorsement by His Holiness the Karmapa when he visited Danang Foundation and Danang Publications in April 2015. 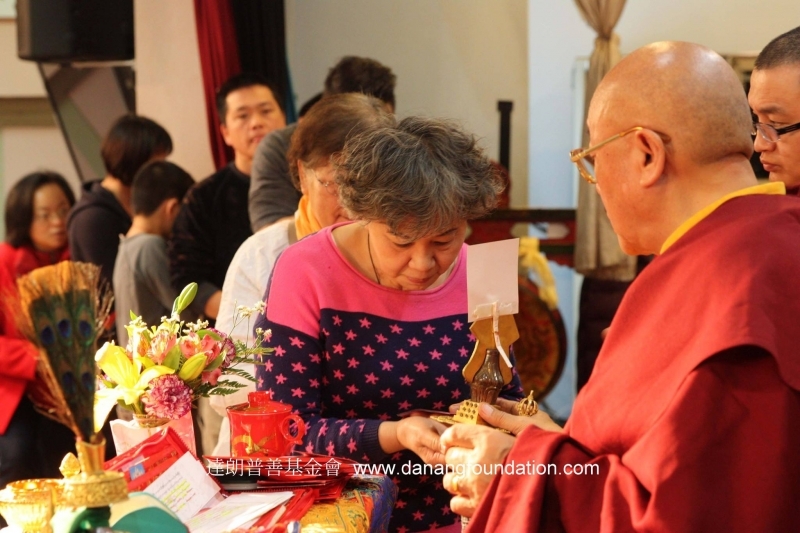 In particular, Danang Publications has landed several ancient editions of important texts in danger of disintegration if not properly preserved. 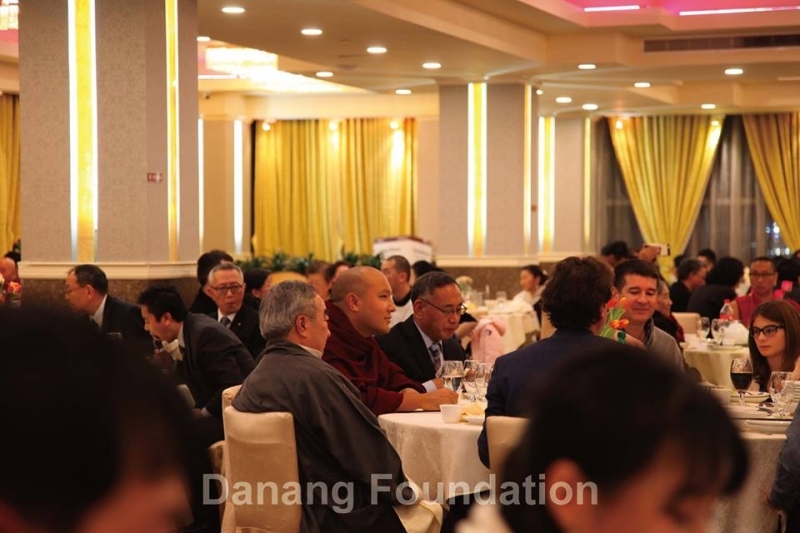 Danang Foundation is urgently seeking funding of at least US$100,000 towards this effort. 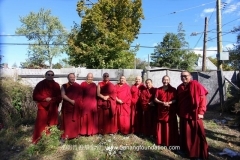 • procurement of two additional recycling trucks for two monasteries in the rural Himalayan areas. 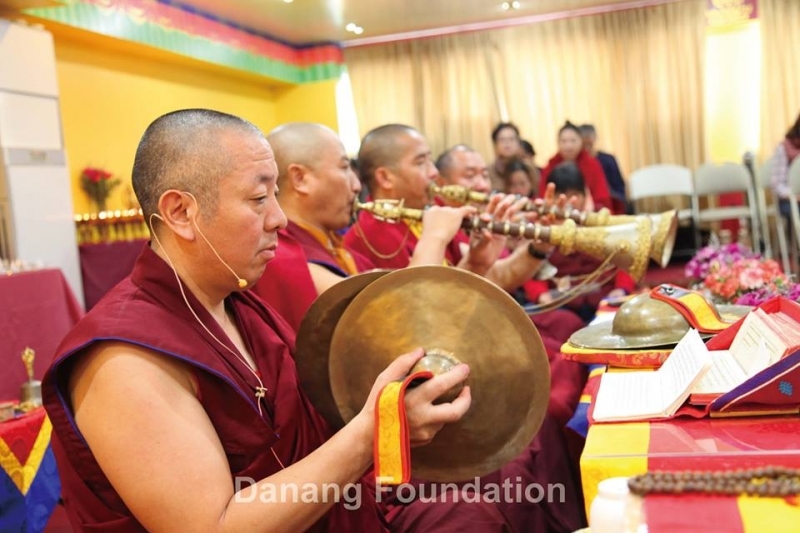 The monasteries put this request forth after Danang Foundation had donated its first recycling truck to Rumtek Monastery in Sikkim in 2013. 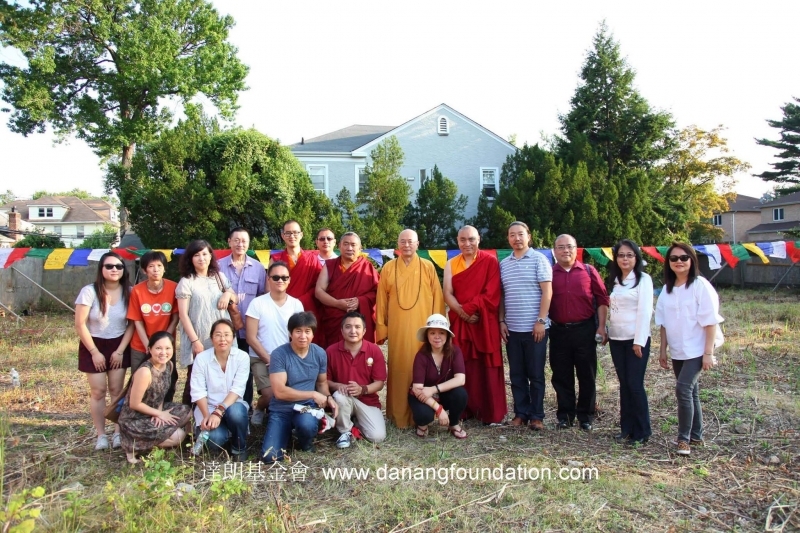 This effort will fulfill Danang Foundation’s efforts in environmental protection. 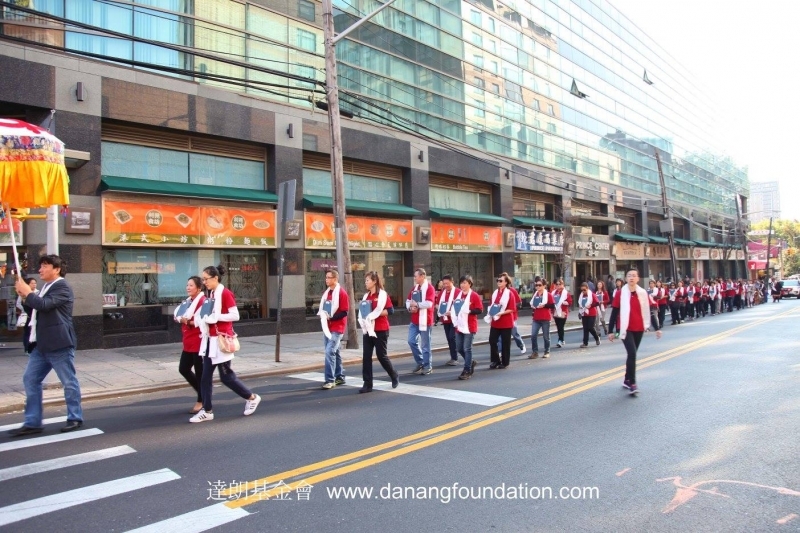 In 2016, Danang unveiled its new logos, to better represent the Foundation’s altruistic activities. 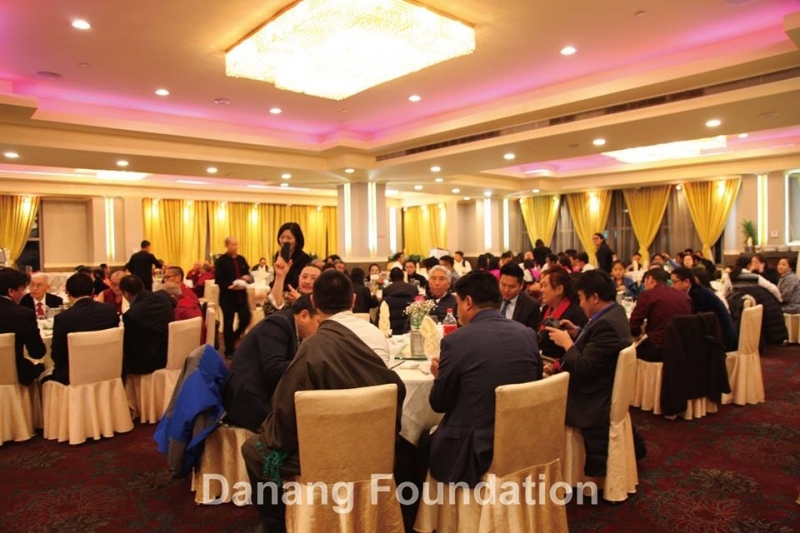 Danang Foundation offers its sincere gratitude to all who have helped in one way or another, however big or small, and those who will join us in our compassionate efforts and intent in the future. 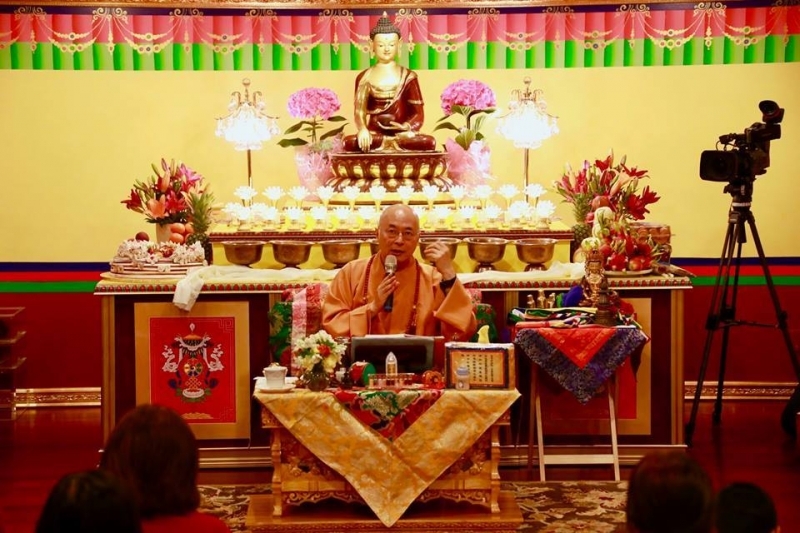 It is believed that the dedication of merits will ensure that the ocean of merit will never dry up, and instead bear fruits in perpetuation until the attainment of Buddhahood. 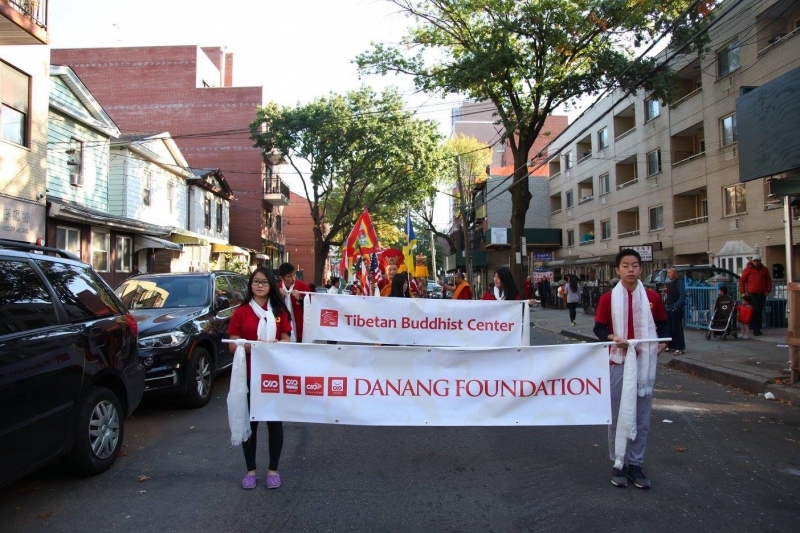 We thank you for your generosity and trust, and look forward to our stride forward, beyond ethnicities, nations and even religions, to provide for and benefit all beings. 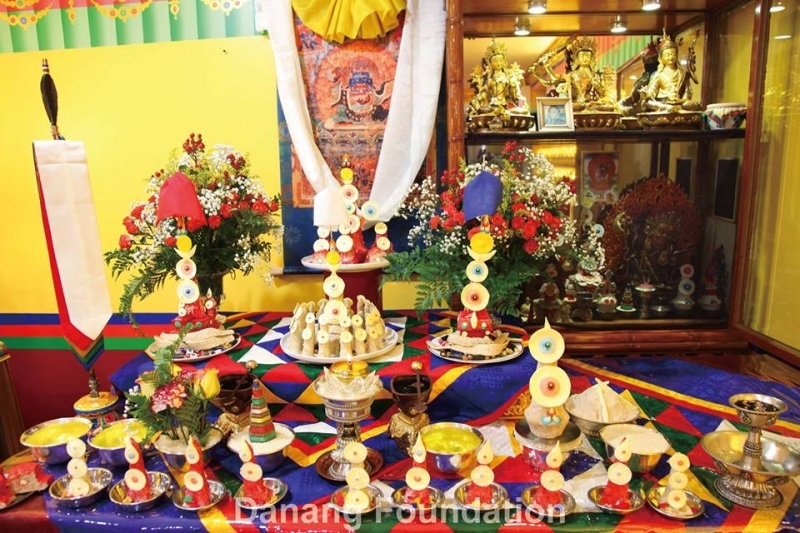 To start off the New Year, Tibetan Buddhist Center invited the Venerable Lamchen Gyalpo Rinpoche to preside over the Empowerment of the Three Wrathful Deities as well as the Purification Ritual via the Practice of Tara. 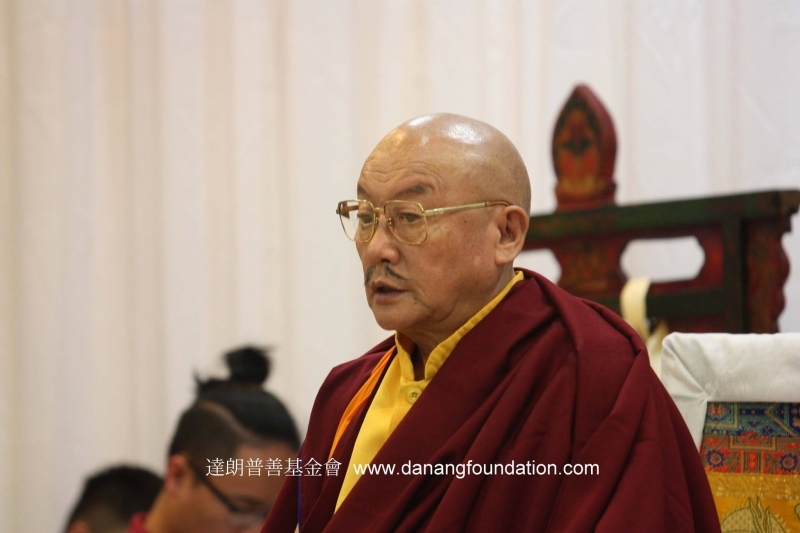 Gyalpo Rinpoche’s birth was prophesized by several accomplished masters, who predicted that he would benefit many beings in his lifetime. 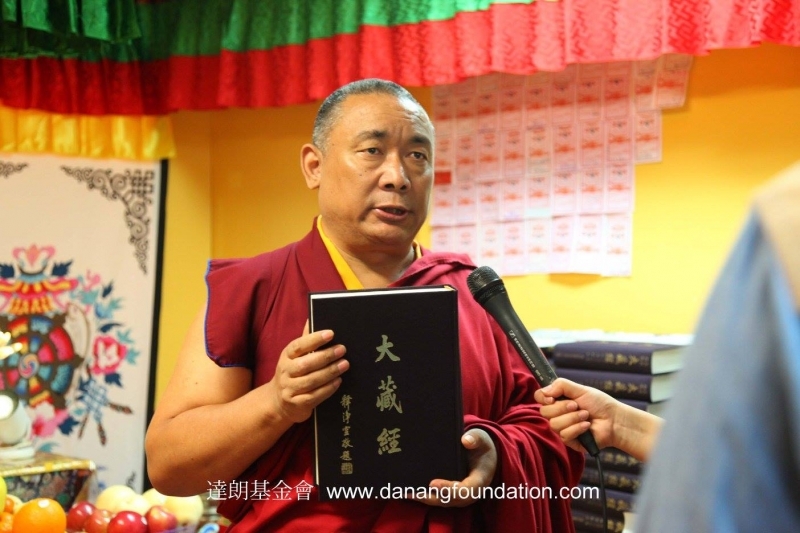 Enthroned since he was eight years old, Gyalpo Rinpoche studied Buddhism from teachers of all four schools. 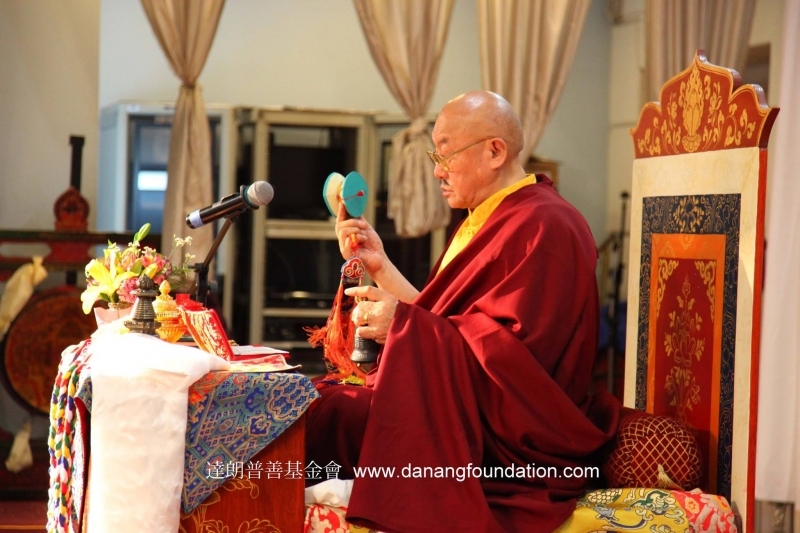 In 1986, while teaching in Germany, His Holiness bestowed the title of Lamchen – the highest order of scholarship and practice in the Drikung lineage, on Rinpoche. Besides several commentaries on Buddhism, Rinpoche also authored books on Tibetan history and astrology.As mentioned in the Kalachakra Tantra, beings in the degenerate age are plagued by countless negative conditions; all kinds of sufferings, including natural disasters, sickness and diseases. 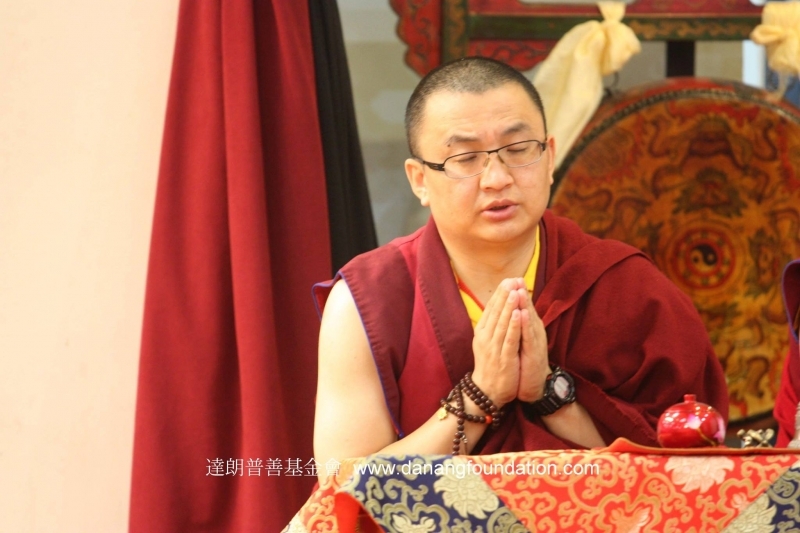 In order to eliminate these obstacles, the bodies, speeches and minds of all Buddhas in the ten directions manifested as the Three Wrathful Deities; Vajrapani – the wise and compassionate one who subdues, Hevajra – who overcomes all harm caused by curses, demons, non-worldy beings and nagas, and Garuda – a manifestation of Vajrapani’s highest wisdom, with the ability to suppress non-conducive conditions, obstacles and illnesses. 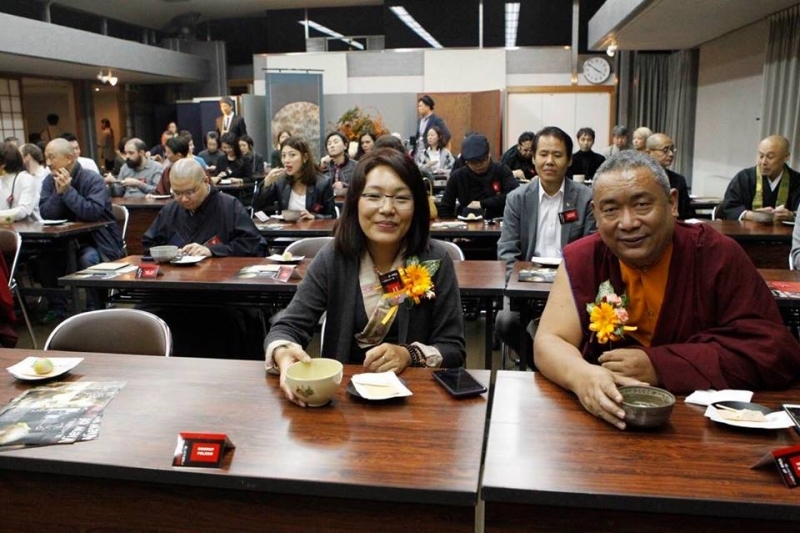 There is none that cannot be absolved by the combination of the Three Wrathful Deities as one. 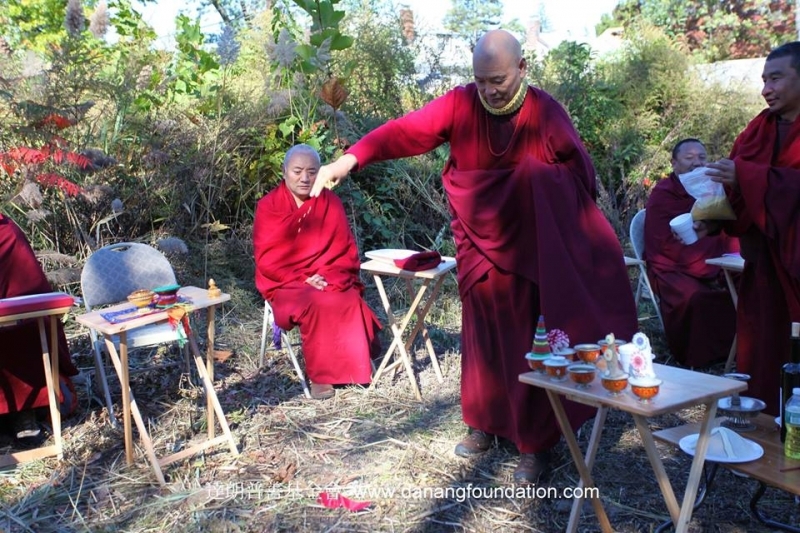 The blessings of the Empowerment of the Three Wrathful Deities purify ignorance, sickness and diseases, and thwarts negativities.It is said that Tara is swift and courageous to aid beings, and the practice of Tara will quickly alleviate suffering, afflictions, all sicknesses, troubles, hindrances, poverty, conflicts, disharmonies, and other worldly troubles, as well as pacify negativities on the path of practice. The practice will increase one’s faith and diligence, and lead to the fulfillment of wishes, longevity, peace and good fortune. 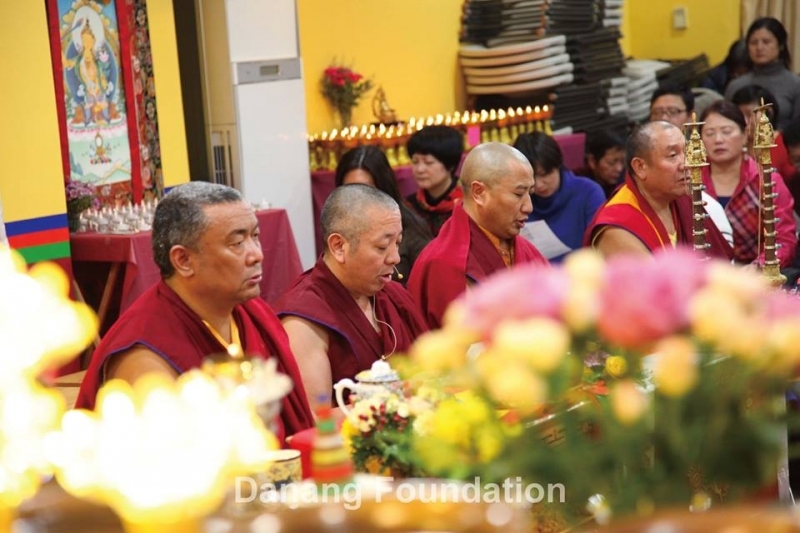 All activities will be auspicious, and beneficial to beings in the ocean of suffering. 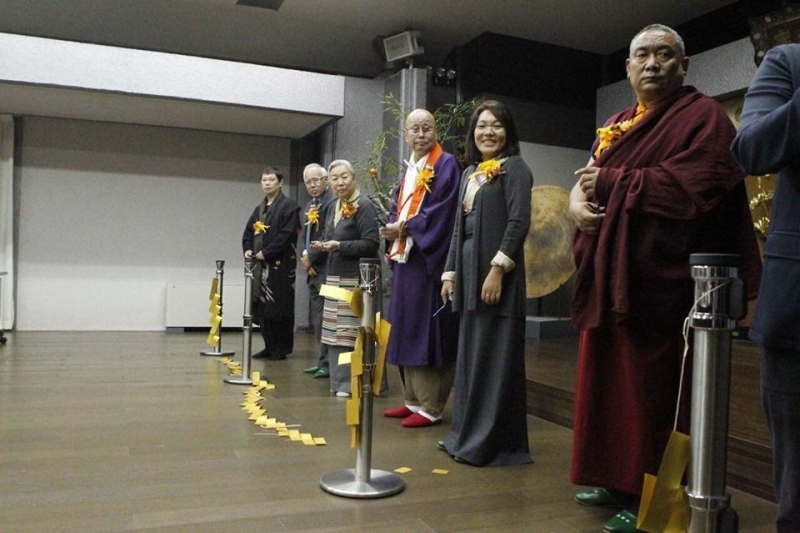 Upon death, one will be be led to Buddha fields, and toward the attainment of ultimate happiness. 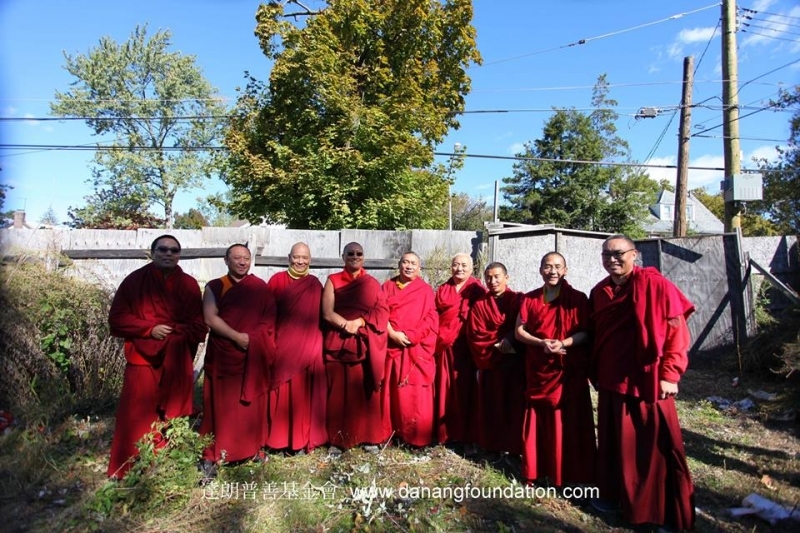 8/12/2015 Tsewang Rinpoche visited His Holiness the 41st Sakya Trizin at upstate New York. 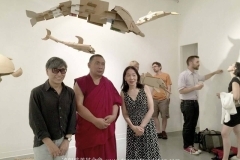 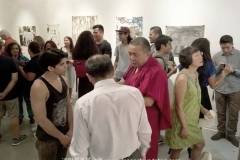 Tsewang Rinpoche was invited to give a Buddhist talk at the opening reception of COMPASSION: For the Animals Great and Small, an interdisciplinary project by artist Mary Ting. 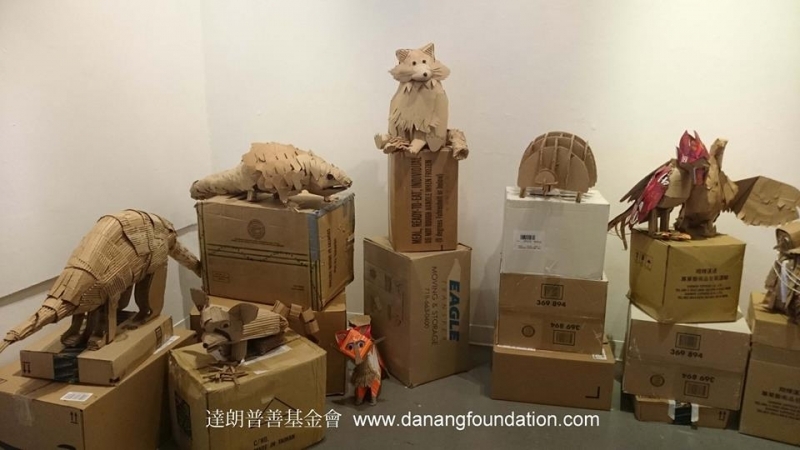 Ting created the exhibition and a series of public programs to create awareness and promote change, in response to the plight of animals such as elephants, rhinos, tigers, bears and others, victimized by poaching for the Chinese market. 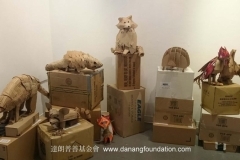 The exhibition, at Gallery 456 @ Chinese American Arts Councils, features a series of drawings and installation of recycled cardboard animal sculptures by the artist and her John Jay College students. Rinpoche framed his lecture in an accessible way, beginning with the basic Buddhist view of Cause and Effect; a cause with reap its corresponding effect, and then expanding this to justify the necessity for human beings to co-exist in harmony with other living things and the environment. 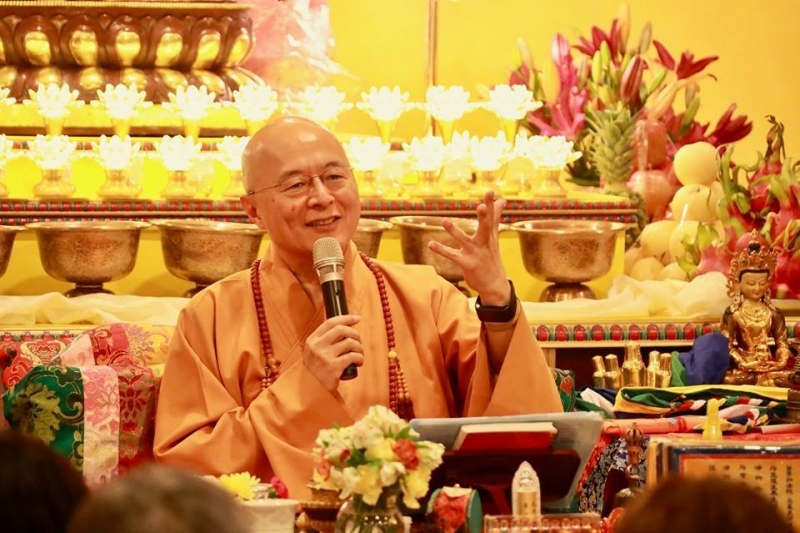 Next, he exposed the Buddhist belief in reincarnation that all sentient beings were once our own parents, and by that perspective, it is necessary that we do not subject them to pain and abuse. 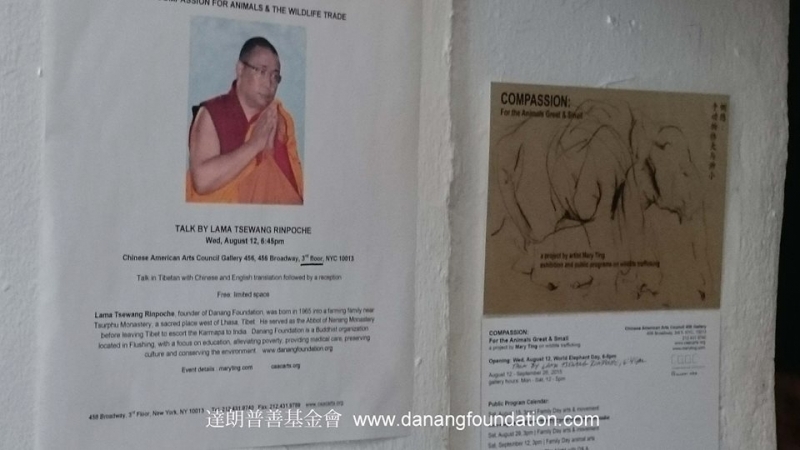 Further, we should cultivate our innate compassion and empathy to all sentient beings, since they are like us in wanting to be free of any form of suffering. 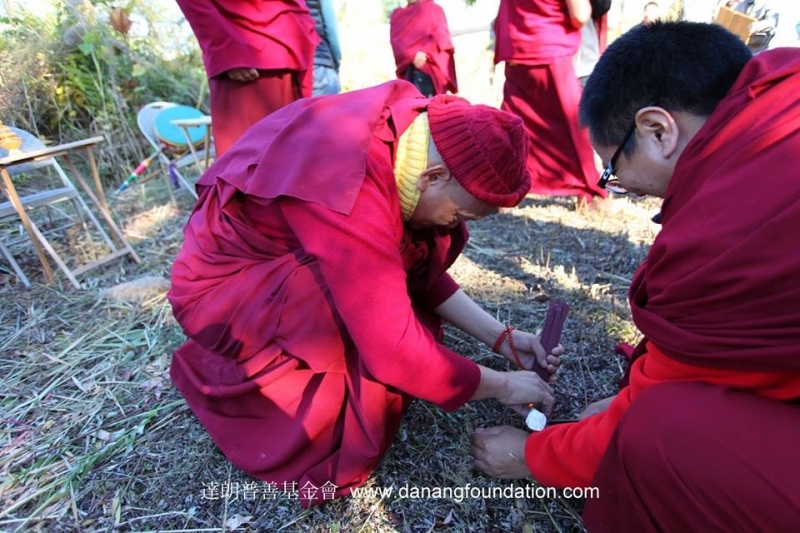 Rinpoche concluded that compassion towards all living creatures, and consideration towards the environment. 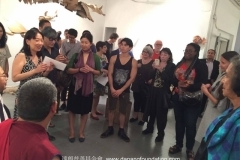 The talk was attended by some 100 guests, who proceeded to ask more questions. 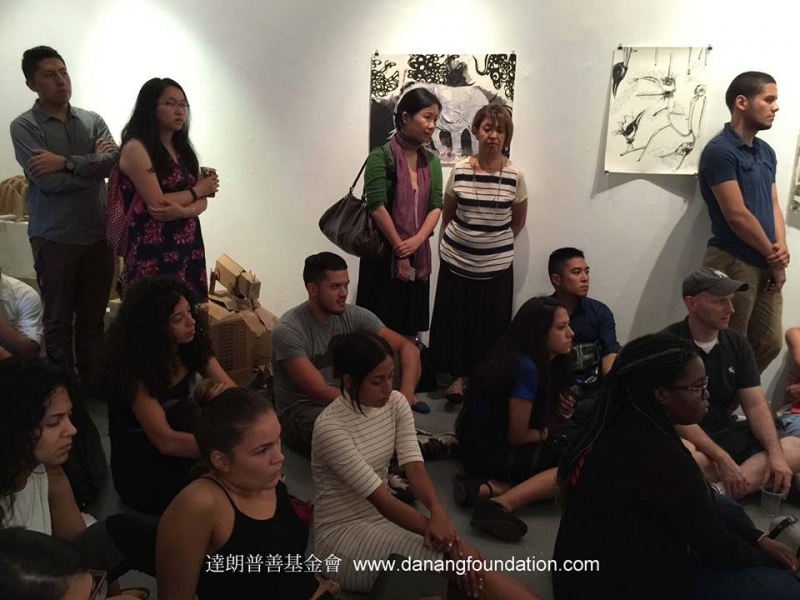 Visual artist Marry Ting is two-time recipient of the New York Foundation for the Arts fellowship, 2012 Lower Manhattan Cultural Council MCAF grantee, 2010 Gottlieb Foundation individual grant, Lambent Fellowship, Pollack Krasner Foundation among others. 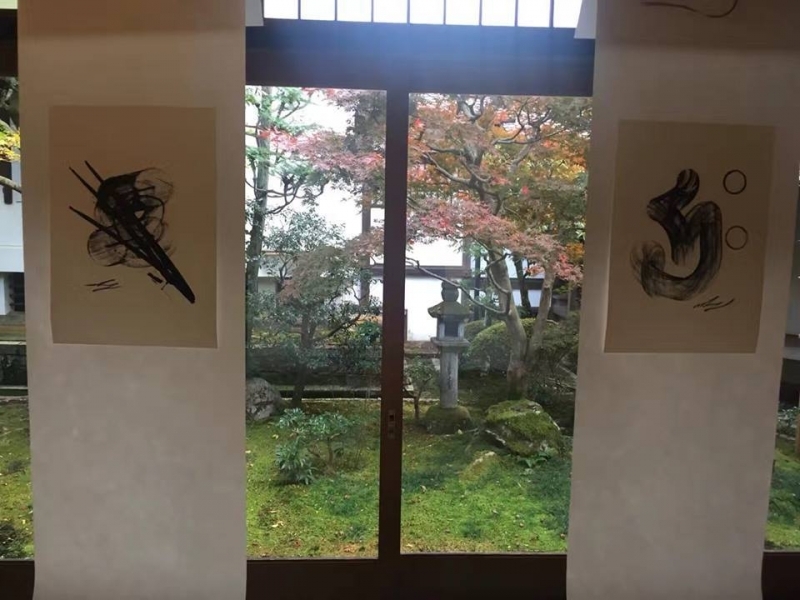 Her residencies include MacDowell Colony, Lower Eastside Printshop Special Editions, Dieu Donne Papermill Workspace, and others. 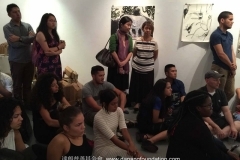 Mary Ting currently teaches at CUNY John Jay College and Transart Institute, New York/Berlin. 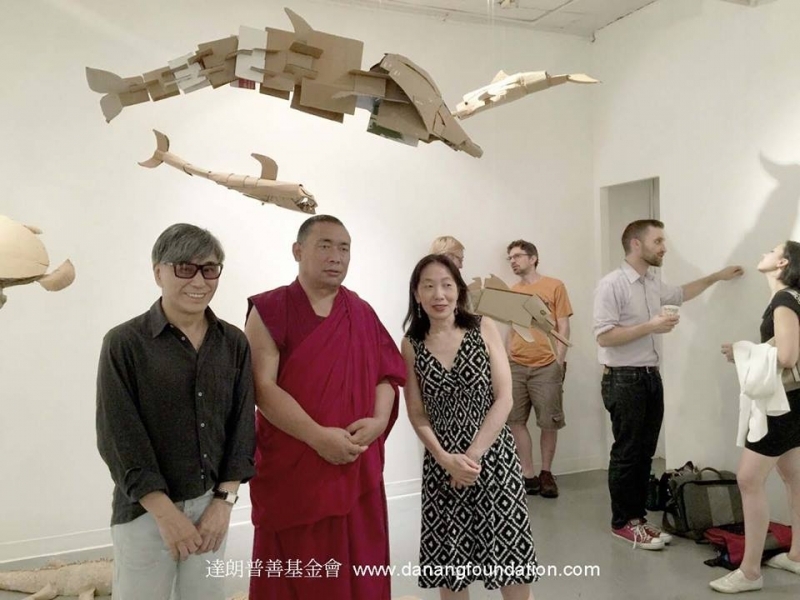 Well-known Sutrayana Buddhist Master Haitao was impressed to find Danang Foundation’s collection of the Chinese Buddhist Canon, the Tibetan Kangyur and Tengyur, teachings and autobiographies of Buddhist masters and other Buddhist texts in the heart of bustling New York. 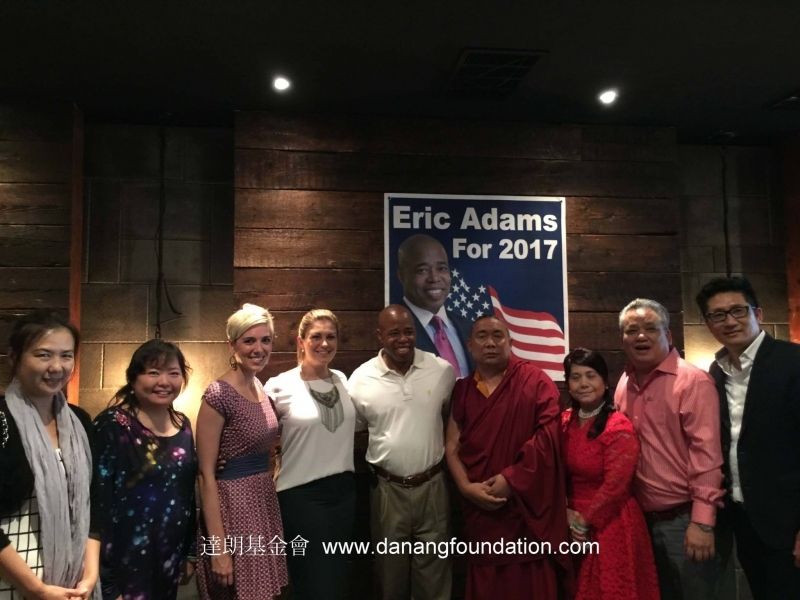 In a show of support towards the Foundation’s work in translation of practice texts and others, for distribution in the United States and Asia, Master Haitao donated a sum of US$5000.00 to the Foundation.